A brand new, never displayed Franklin Mint die-cast Spitfire of 303 Kosciuszko Polish RAF Squadron. B11E082 A very rare model. From pet and smoke free home. Outer mailing box is taped up and has minor creasing (as it was posted to me like that)but the actual box is in mint condition. I am away until 24th of April. Items sold will be dispatched on or after that date. Sorry for inconvenience. 1/48 Scale Diecast Model by Armour. Scale 1/48. Ending Soon. New Arrivals. The RM Toys Team. Kind Regards. MINT - The item is in perfect condition. Our aim is to ensure no matter what the model, we will provide an excellent service experience. Armour model no COA or outer box inner box in EXCELLANT. J lander (Big Beautiful Doll ). New Franklin Mint Armour Collection B11B579. Hawker Hurricane MK. (This is aCDC 1:100 Royal Air Force B.Ae Hawk "100 Squadron 5059. CDC 1:100 Aircraft). P-51D Mustang USAAF "Ridge Runner" 355th FS, 4th FG. 20.68 victories. CDC Armour Collection Armour. Franklin Comme neuf Armour 1/48 Scale Diecast F-18 HORNET "TOP GUN"
This model depicts an aircraft operated by the United States Navy Strike Fighter Tactics Instructor program (SFTI program), more popularly known as TOPGUN, which teaches fighter and strike tactics to selected naval aviators and naval flight officers. (This is a CDC USAAF P-47 Thunderbolt ´WW 2 Aces´ 5372. CDC 1:100 Aircraft). Warnhinweise nach EU-Spielzeugrichtlinie Nicht für Kinder unter 3 Jahren geeignet. Für Kinder / Jugendliche unter 14 Jahren nicht geeignet. VB of 5th FS. (This is aCDC 1: 100 Luftwaffe Junkers Ju 87 WW2 Aces 5350. The model has not been displayed and has the CDC Catalog. CDC 1: 100 Aircraft). (This is a CDC 1:100 F4U Corsair of the Aeronautique Navale ( French Naval Aircraft) F4U Corsair 5285. CDC 1:100 Aircraft). The model has been displayed but is in excellent condition. Armour Collection Mitsubishi Zero " Zeke " A6M3 MDL 32-IMP NAVY 6TH, KOKUTAI. wird hiermit ist ausgeschlossen ! - insbesondere evtl. vorhandene Mängel, beschreibe ich daher ehrlich und zutreffend. This is a CDC 1:100 F-86 Sabre of the USAF ´Korean War Aces´ 5129. CDC 1:100 Aircraft). (I have previously listed a large number of Lockheed Starfi rs before collecting those exclusively I had collected many. This is a CDC (Collection Armour) Pre-Franklin Mint U.S NavyF-104A 'China Lake'. There were at least 2 F-104's supplied to the Navy for AIM9 tests. One of which 740 is depicted here. is far too opimistic I have sent 6 to US and Canada shortest was 3 weeks longest. ARMOUR/FRANKLIN MINT - B11B679 1:48 SCALE BOEING MCDONNELL DOUGLAS CF-188A HORNET ROYAL CANADIAN AIR FORCE 410 COUGAR SQUADRON COLD LAKE ALBERTA 1993 AIRSHOW MARKINGS. THE BOX IS EXCELLENT & HAS THE LID COVER. 1/48 Scale Diecast Model by Armour. Scale 1/48. EXCELLENT - The item will have had very careful use, with only small imperfections. GOOD - The item will have had more use, showing obvious imperfections. Berlin - 1:48. Es handelt sich hier um seltene Sammler Modelle der Firma Collection Armour im Maßstab1:48 die sehr schön verarbeitet sind. Schon lange Ausverkauft ! B11B544 - P40 WARHAWK diecast model aircraft, green with yellow tiger head. U.S.A.A.F. - 'Aluetian Tigers - World War II. 1:48th scale. ALL PARCELS. No models will be dispatched until funds are cleared. 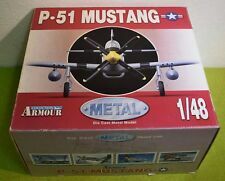 (This is aCDC model of 1:100 A4 E/F Douglad Skyhawk USMC ´Top Gun´ 5223. CDC 1:100 Aircraft). DH98 Mosquito. Warnhinweise nach EU-Spielzeugrichtlinie Black Rufe. Nicht für Kinder unter 3 Jahren geeignet. Für Kinder / Jugendliche unter 14 Jahren nicht geeignet. 1/48 Scale Diecast Model by ARMOUR. Scale 1/48. MINT - The item is in perfect condition. The MODEL is in the following condition - MINT. The BOX is in the following condition - EXCELLENT - Slightly worn. RAF CANADAIR MK4. (note plinth is missing). I photograph all parcels prior to dispatch. Modèle d’avion Phantom F-4 « Ange bleu ». FJ-3 FURY US NAVY (Korean War). Really nice model nothing glued back on as far as I can see or bits missing. B11B265 / 98109. Stuka JU 87 Dora RUDEL. Hans-Ulrich Rudel's "Tank Buster", III/Stukageschwader 2, Eastern Front, 1944. German Junkers Ju 87G-2 Stuka Dive-Bomber. Franklin Mint Armour Collection. Maßstab 1:48. (This is aCDC 1:100 model of a USAF F-100 Super Sabre 5191. CDC 1:100 Aircraft). Es handelt sich hier um seltene Sammler Modelle der Firma Collection Armour im Maßstab1:48 die sehr schön verarbeitet sind. Schon lange Ausverkauft !